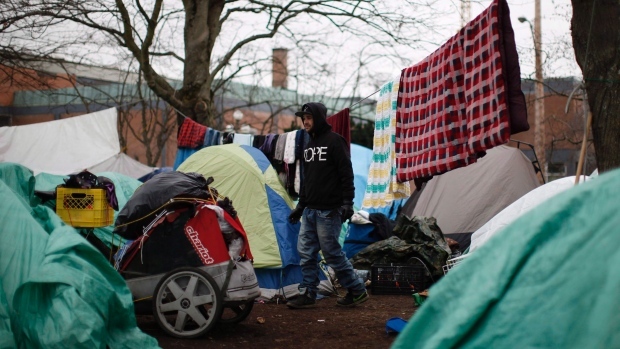 VICTORIA - Police in Victoria say they won't immediately enforce a Thursday deadline aimed at clearing residents from a tent encampment in the city's downtown core. A news release posted by Const. Matt Rutherford says there is no legal order in place that would prompt police enforcement at the tent city on the lawn of the courthouse. The province is seeking voluntary compliance of the request that the camp be cleared by Thursday. If or when a court order is in place, police say they will use the most appropriate and safest way to carry it out. Housing Minister Rich Coleman confirms there are no plans for a major eviction when people are expected to leave and that he's hoping the homeless will take advantage of nearly 90 new shelter units and transitional housing spaces. Coleman and police say they will be closely watching a rally planned at the camp on Thursday afternoon, with police noting it's expected to be peaceful though officers will be on hand to ensure safety.